Using a combination of Picaridin and water-resistant agents, our products are designed to keep you protected. Whatever the season, wherever the place, skin-friendly Moskito Care blocks bites from blood-sucking pests even in the extreme outdoors. 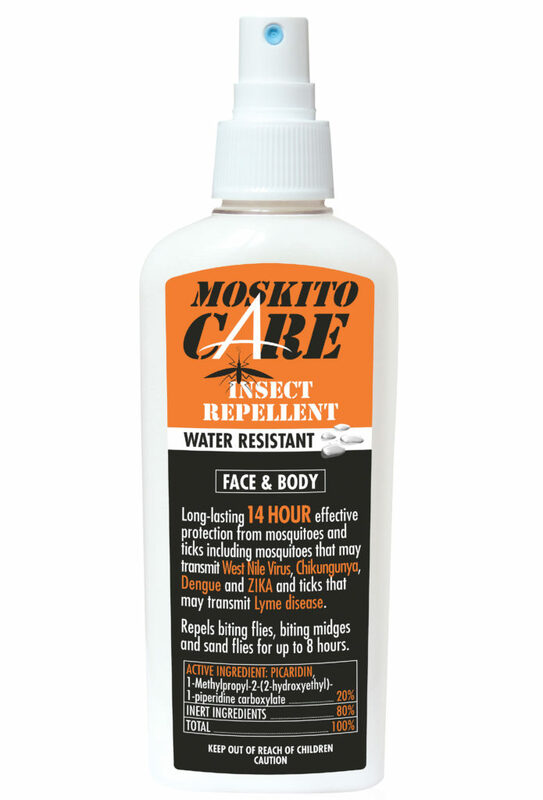 Purchase Moskito Care Online Today! © 2017 Mosquito Care. All Rights Reserved. Lyme disease is a bacterial infection that is typically spread to humans by ticks. Not all ticks carry the bacteria — most often, Lyme disease is spread by the blacklegged tick, commonly referred to as the deer tick. Not all deer ticks carry the bacteria, and it is very possible to be bitten by a tick without contracting Lyme disease. Signs associated with Lyme disease vary widely depending on a person’s overall health and the stage of the infection within the body. Within the first month after an infected tick bite, individuals with Lyme disease could develop fever, joint and muscle ache, swollen lymph nodes and headaches. As these are symptoms common to a number of illnesses, if you don’t know you were bitten by a tick, it can be easy to miss the symptoms of Lyme disease. Many people also develop a rash at the site of the bite, and that rash can expand over other areas of the body. Days to months after being bitten by an infected tick, individuals might develop arthritis, stiffness in the neck, dizziness, nerve pain, heart palpitations, Bell’s palsey, short-term memory problems and other serious health issues. If you develop any of these symptoms regardless if you are aware of a tick bite, you should seek diagnostic testing for Lyme disease from your medical provider. The best protection against Lyme disease is protection against tick bites. Keep overgrown grass and bushes trimmed back from your home and nearby paths and walkways. When venturing into the woods, wear light colored long pants and shirts and use an EPA-recommended repellent with an approved active ingredient, such as Picaridin. Spray your skin and your clothing for maximum coverage. Within two hours of outdoor activity in tick-prone areas, change your clothing and take a shower. Inspect yourself for ticks and remove them if you’ve been bitten. Ticks can enter the home on pets, children, gear and clothing, so inspect everything carefully and wash all items appropriately to keep ticks out of the home. While prevention is the best medicine, Lyme disease can be treated with an antibiotic. Treatment is most effective when the disease is caught in the earliest stages. According to the Centers for Disease Control and Prevention, between 70 and 80 percent of people who contract West Nile virus never develop symptoms. Most people who have been exposed to the virus never know it. Most of these flu-like symptoms disappear within days. Fatigue and weakness, however, can continue affecting a person for several weeks or even months. Unfortunately, it can take several months to recover from these symptoms. Some people will experience neurological effects for the rest of their lives. About 10 percent of those who get neurological infections like encephalitis will die. West Nile virus has been found in most parts of the world, including the United States. In fact, all but three states (New Hampshire, Vermont and West Virginia) have reported West Nile infections in humans. Even the three states without human infections have found the virus in birds, which suggests it’s only a matter of time before someone gets exposed. Insect repellent is one of the most effective ways to protect yourself from mosquitoes that carry West Nile virus. The Environmental Protection Agency (EPA) recommends following some safety guidelines when using repellents. These guidelines recommend spraying repellent on exposed skin and clothing. You should not apply it to your eyes, mouth or any areas with scrapes, rashes or cuts. When applying to your face, first spray the repellent onto your hands and wipe a small amount on your skin. Since there isn’t a vaccine or cure for West Nile virus, you should follow these tips to reduce your risk of infection. In February 2016 the World Health Organization (WHO) declared the Zika virus to be a Public Health Emergency of International Concern. The CDC raised its Emergency Operations Center (EOC) to Level 1 activation, the highest level. As this mosquito continues to spread, it is important for people all over the world to protect themselves from this disease. Few people who get the virus visit the hospital. Many don’t even realize they have a sickness that may require medical attention, which makes it difficult to determine exactly how many people have been exposed. The threat of the Zika virus is much greater for pregnant women. The Zika virus can be passed from a pregnant woman to her fetus. The virus can cause birth defects like microcephaly and other fetal brain defects. Microcephaly is a condition that prevents the brain from developing and growing correctly, resulting in a small, misshapen head. Zika has historically been a problem for people living in Africa, the Pacific Islands and Southeast Asia. More recently, researchers have found the virus in several U.S. territories, including Puerto Rico, American Samoa and the U.S. Virgin Islands. This raises concerns that the virus will continue to spread throughout the continental United States. In the first half of 2016, the only Zika cases within the U.S. were contracted by people visiting other countries or sexually transmitted by someone who was affected abroad. However, in late July 2016 officials in southern Florida identified the first cases of Zika to be caused by mosquitoes right here in the continental U.S. Since Zika can cause serious health problems, it is important for people to learn how they can protect themselves from the virus. If you are traveling and pregnant or plan to become pregnant, visit the CDC’s Zika Travel Information page to ensure that your destination is not currently under a Zika Travel Notice. The Environmental Protection Agency (EPA) suggests that using insect repellents can keep mosquitoes, and therefore the virus, at bay. An EPA-Registered repellent with one of the following active ingredients is recommended: DEET, picaridin, IR3535, oil of lemon eucalyptus or para-menthane-diol. Since the mosquito that transmits Zika is a daytime biter it is important to re-apply repellent throughout the day, according to instructions. To use insect repellents effectively and safely, spray it on clothing and exposed skin. Do not apply it to your mouth, eyes or any open wound areas. When applying to your face, spray it on your hands and wipe it on your skin. Visit our Application Tips section of the site for more detailed information. While you may not be able to single-handedly stop the spread of Zika, you can protect yourself, your loved ones or your employees by learning more about the disease, avoid pest bites by using an effective insect repellent, and by making informed decisions when spending time outdoors.